You know how I said I was going back to Oregon from Texas? Well, that didn't quite happen. Instead my boys came to Texas to be with me and the family! So here we all are, camping out and spending time with my dad, and reading whatever books we find on Nana's bookshelves. We've scoured the place and one of our favorite finds this week is a book that has particular meaning to me. Because I grew up with it? No. Because I like the message? (Well, I do, but . . .) No. It has particular meaning to me because I know the illustrator, Paula Becker. 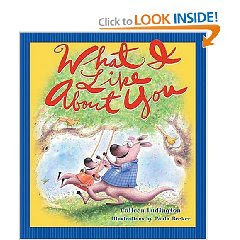 What I Like About You is the story of a kangaroo who is being assured that he is loved and cared for by his creator. 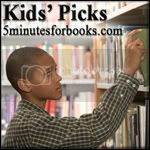 It is a message to the young reader, affirming that they have great worth and value. "God knows all about you, and He smiled when you came. He delights in your laugh and the sound of your name." It is a beautiful message for young children to hear, know, understand and believe. I'm quite fond of this book. and I encourage people to check it out! This book has a message that is worth sharing and hearing. Perhaps, just perhaps, this book is not just for kids after all! I LOVE finding wonderful books on bookshelves. When we were on vacation a couple of years ago, the hotel had some children's books in the common area, and it was there that I found out how great Horton was. Hi Carrie!! I just got back from a wedding. How's it going?